Caution, Are you looking at employee engagement as a problem to to solved. Are you seeing employee engagement as a problem to be solved, snagged by focusing on what is rather than what could be? Do you see the capabilities in employees and the organization? What are the engagement potentials? Can you see the fluidity of employee engagement or is a once a year survey measure that makes it appear fixed and something you need to fix? What fresh and new approaches have you used to enhance employee engagement? Can you see employee engagement in a new way? Will you approach the essence of employee engagement, work, from a playful perspective. Apply a playful approach to see the capabilities concealed in your familiar categories, constructs, concepts, ideas, rules, and understandings of employee engagement. I like the idea of play over problem solving. You never really can predict what you’ll get just by shuffling things up. I like the game metaphor too because just like in any game, you can’t always predict the outcome. In fact, there’s lots of room for surprises … surprises in a good way. With so much fear running rampant I worry that play will be seen as a frivolous thing to be doing when we probably need it most. Time to reshuffle our concepts, thoughts, and abstractions into powerful and caring actions. This is great! 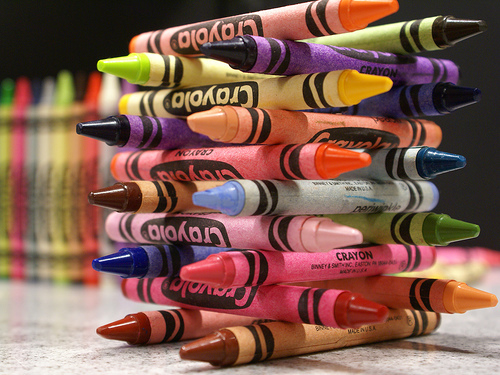 Our house is full of crayons. We owe their presence to our six year old Daughter and we all use them. I love to play to solve. I love having fun at work and I don’t care who knows it. It’s contagious this fun thing. I concur with the fear thing too so perhaps a bit of reshuffling is in order, well you can have too much of a good thing eh? Point 4. I’m trying to help fluid things up. Our engagement survey is now quarterly, it has far fewer questions than before and plenty of them are easily reusable locally. I’ve managed to squeeze in most of the 12 questions asked in the totally fabulous “First Break All The Rules”. I encourage people to use questions from the main survey if and when they feel the need to do something locally. That way they can use past and future editions of the main survey to plt trends, rather than just dolloping surveys around the place in isolation. Point 5. Recently we did some video vox pops – “how does it feel to work here” kind of thing. Also – we took some really powerful written feedback from the most recent survey and recorded it onto audio files. Great way to tee up a discussion at meetings etc, very powerful and of course, another way of taking in info. Point 7. You’d better believe it! Thanks for you comments. I think another key in surveys is to ask: what can you do right now to improve your engagement or the engagement of another employee. I love the story component of point 5 that you achieved. Is there somewhere to see a few of these? When you play you stay and engaging in play is powerful engagement. I love it! I also like to use the metaphor of the garden. The right soil, light, and water, ongoing care. When you create the conditions for success, great things (engagement, trust, motivation) can grow. The garden metaphor can really grow on people. I loved the book and movie Being There showing the power of the garden metaphor. I haven’t read that book, will check it out!